Sage Accpac provides a completely integrated suite of applications to streamline your service and support processes from virtually any touch point. As a service business, you will know that the key to success is a streamlined and efficient call centre that presents all the information your staff need when they need it. Moreover, this level of information must flow throughout the business from the Board to the Technicians on the road and out to the Customer via a web login or SMS technology. • Holistic view of all customer interactions from call logging to dispute resolution. • Complete integration to either SAGE Accpac service suite or third party product sets. • Full tracking of jobs and planning of resources and sub-contractors. • Integrated Call Centre with escalations and alert management. • Web and Wireless presentation of any information anywhere, anytime. 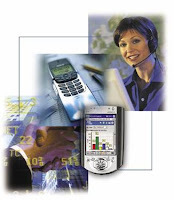 • Full PDA capability for mobile sales force and mobile technicians allowing them to receive and process jobs on the move. • Award winning integrated e-marketing solution for permission based communications. Gartner 10 strategic technologies in 2010.